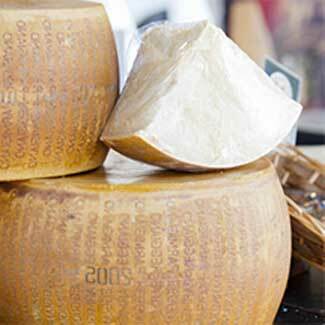 Oh Parmesan, how do I love thee? Let me count the ways. . . If you’re a regular reader of my newsletters, you probably think I’ve never met a food I didn’t like. 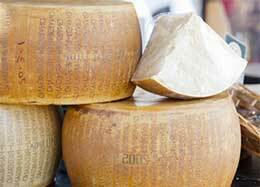 But if I were to list them all in preferential order, Parmesan would definitely be pretty high on the list. I actually love Parmesan so much that I made a point to participate in “Parmageddon,” an event when Whole Foods attempted to shatter the world record by simultaneously cracking over 400 wheels of authentic Parmigiano Reggiano across the US, Canada and the UK. The “commercial” for it was a compelling 30 seconds. While being part of a world record was enticing, I have to confess that they had me as soon as they mentioned free samples. It was thrilling to eat parm right off the wheel solo, but for me Parmesan is good wherever it is: as a crisp, on (or in) fresh baked bread, or as part of one of my favorite dishes to make on a winter day – Chicken Parmesan. The blend of hearty chicken, spicy tomato sauce, and bubbling cheeses (Don’t feel left out mozzarella. I love you too!) make Chicken Parmesa such a satisfying and comforting meal. 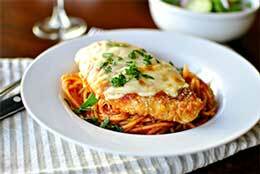 Personally, I start my Chicken Parm off with the Weight Watchers’ version of the recipe. Really, I love it because it’s tasty and I don’t have the mess or time of frying. Frankly, it’s also easier to add my sauce and cheeses if it’s already in the baking dish. I also use this recipe because it’s healthier. Despite my constant discussion of chocolate chip cookies, I do try to be health conscious. Sometimes this contradiction makes me feel a little like Jean Nidetch, the founder of Weight Watchers who had an admitted obsession with cookies. Click here to read more about the birth her franchise. Like the Chicken Parm, Ms. Nidetch had a good idea, which spread worldwide as franchise. She also took her company public the same year. So it isn’t just the 50th anniversary of the franchise, but November 15th will also mark the anniversary of its IPO. 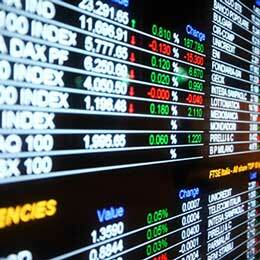 Registers its securities with the Securities and Exchange Commission (SEC). Lists those securities on a securities exchange, such as the NYSE or NASDAQ or some other securities quotation system. Offers those securities to the public for the first time. Some of you small business owners may be thinking about having your company “go public.” Should you? Why? Enhanced public profile for the company. Going public generally improves the perception of a company’s financial stability and transparency. In addition to the initial publicity associated with the IPO, an IPO also increases public awareness of the company through greater ongoing press and analyst coverage. This exposure may help sustain demand for and liquidity in the shares, which can mean more cash per new share from the new investors. Did I say more cash? Yes, I did. A successful IPO by a company offering its securities to the public can generate substantial proceeds for a company. This large infusion of capital permits a company the opportunity to expand its operations, build any necessary infrastructure, deliver more products and services and accelerate its growth. Potential loss of control. That means Mom and Pop no longer call the shots alone. The sale of a portion of the company’s equity inevitably means a loss of control for the pre-IPO investors and management. Significant acquisitions and other strategic decisions may require the prior approval of stockholders. Time and cost of disclosure and reporting requirements. Both during and after the IPO process, the company will be subject to extensive rules and regulations including the SEC’s periodic reporting requirements. Preparation of required reports and other documents, and the design, implementation and maintenance of the internal controls, procedures and systems necessary to do so, will require a significant amount of time of company personnel and expense.